Thousands of designers, architects and buyers representing hundreds of international suppliers are descending upon Riyadh this month to capitalise on the boom in interior design spending across the Kingdom. 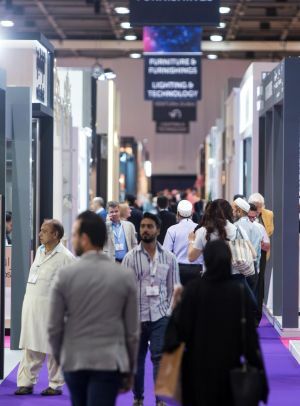 Saudi Arabia accounts for almost one third (32%) of the total GCC interior design market spend, some SAR11.25 billion of a total SAR35.6 billion, according to a recent Ventures report commissioned by INDEX Saudi, the new design exhibition which runs at the Riyadh International Convention and Exhibition Centre from 30 October to 1 November. The renewed demand for high quality interior design and fit out services in the Kingdom can be attributed to the influx of new residential, commercial and hospitality projects as well as the host of new schools and hospitals planned across the country in preparation for Saudi Vision 2030. While the report shows that Saudi Arabia is the biggest investor across the Gulf in healthcare and educational property fit-outs, with the specific markets estimated to be valued at SAR1.425 billion and SAR926 million respectively by 2019, it also highlights that the residential sector takes top spot in value for the country’s interiors industry, worth SAR4.5 billion and forecast to grow to SAR5.12 billion in 2019. Among the hundreds of international product manufacturers and interior design firms confirmed to take part in INDEX Saudi include Al Yamama Factory for Wooden Furniture, International Timber Company Ltd. (ITCO), Tanatel, +Object, Sleep Nice, Gift Mart, Taxiat Trading Co and Mineheart. Jalal Ozgen, Division Manager, International Timber Company Ltd., said: “The Saudi Market is still the most stable market when compared to other countries in the Middle East despite all its economic woes. The furniture industry in particular will continue to be active because of the renovation activities and because of KSA’s ambition to develop the touristic sector and living standards. The show will attract thousands of interior designers, architects, project managers, retail buyers, importers and distributers from the full spectrum of hospitality, residential, retail, educational and commercial design, and take place at a time when designers are looking to ensure their projects stand out in the crowd to make the most of the country’s burgeoning interiors market. Jaafar Shubber, Event Director for INDEX Saudi, said: “Upcoming mega projects in Saudi including the King Abdullah Financial District, Kingdom City and Jazan Economic City mean that the country is investing vast amounts of money into new and redevelopment construction and fit-out projects in the next decade. Across all sectors there is a definite sense that we are at the precipice of a dramatic shift in the history of the design industry. To register to attend for free, visit www.index-saudi.com.